AirBox Neo provides automated content streaming and broadcast playout for any kind of TV channel – cloud based, satellite, cable head-ends, over-the-air broadcasters, corporate TV, internet-based TV and etc. 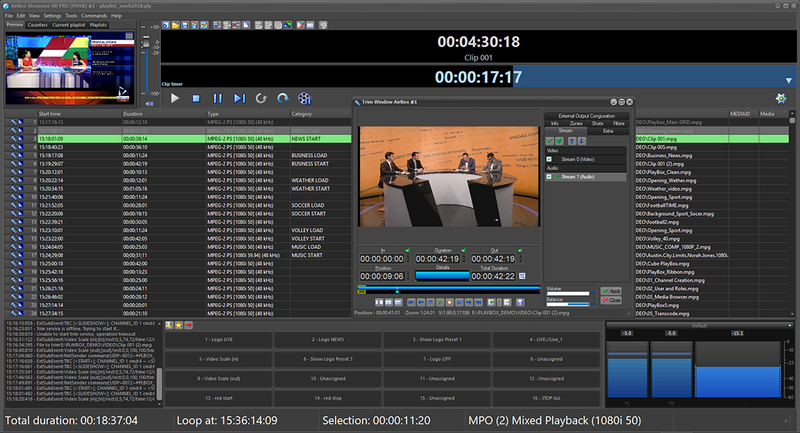 Via its scalable, extremely robust and reliable multi format parallel output playout/streaming engine, AirBox Neo can easily mix variety media files in one playlist and provides multiple SDI/IP streaming UHD/HD/SD outputs simultaneously. Endless freedom of operation - any changes of the playlist during on-air session are possible! Media can be trimmed, edited or repositioned. Live productions are streamlined to allow insertion and/or execution of various events or live streams into the playlist. For automated playout/streaming AirBox Neo allows playlist scheduling for weeks ahead. Gaps/Time overlaps are automatically resolved to ensure continuous operation even when conflicting timed events are present. Special facilities ensure uninterrupted operation if content files or even entire schedules are missing or misplaced. Compatible with a vast variety of compression types: MPEG-2, DV, DVCAM, DVCPro, DVCPro 50, DVCPro HD, IMX, XDCAM, HDCAM, AVC/H.264, HAVC/H.265, XAVC, Apple ProRes, DNxHD, AVC-Intra etc. 3rd party equipment control - Kramer, Leitch, Network Electronics, Pesa, Quartz, Grass Valley Concerto / Acapella, Sierra, Elpro, Snell, Utah, Miranda Technologies, Ross, BlackMagic Video Hub, BlackMagic ATEM TV Studio, GPI, DTMF, etc. Control under external automation via VDCP, GPI, DTMF, Network API, SCTE-104, etc. PlayBox Neo is registered trademark. Other mentioned trademarks are property of their respective holders.